Bill Maher is a very smart man. I totally disagree with his politics, but he is a very smart man. Townhall posted an article today about his comments on the Democrat Party’s decision not to allow Fox News to host any of their primary debates. “Last week, the Democrats made a terrible decision when they announced that they had turned down Fox News’s offer to host one of their 2020 primary debates, saying that Fox was nothing more than propaganda. OK, so why not go on Fox News and tell them that?” Maher asked rhetorically. Telling you side of the story to people who disagree with you helps you refine your side of the story. Maher is right. If the Democrats claim to be the “resistance” then they should be fearless. If they truly believe in what they’re saying then they should have absolutely no problem answering the tough questions Fox News has for them. Conservatives have to continually talk to liberal news anchors and reporters because the majority of news outlets are liberal. If conservatives refused to talk to liberal outlets then they’d be construed as “cowards” who are hiding from the tough questions. It’s 2019. Get it together, Dems. If your candidates are too afraid to answer questions they don’t like while they’re running for president, then they won’t be able to handle the weight of answering tough questions while president. Get out the popcorn. Its going to be a very interesting year and a half. Television news and the internet are buzzing this weekend with news of a photo in Democratic Virginia Governor Ralph Northam’s medical school yearbook of a ku klux klan member and a person in blackface. The picture is from the mid-80’s, but the outrage is current. The Daily Caller posted an article today that explains what the fuss is really about. But I want to touch on a comment you made in the phrase human dignity because this is the second moment where Ralph Northam this week failed to respect human dignity. The first moment, of course, was when he made his ghoulish, horrific statements about abortion. This was his second PR debacle this week. Previous to this blackface-KKK robe-moonwalking press conference he was on a radio show. He’s a pediatrician talking about — talking about aborting children at the moment of birth and then even after they had been delivered. I agree with you, Bakari. Human dignity matters and we ought to respect every human life of every race, especially these poor babies who are laying in delivery rooms when you have governors of states that think we should have a discussion about murdering them after they were born? Finney quickly spun the conversation back to “racism in America” without ever pointing out what exactly Jennings had said that was not true. “So in this particular example if a mother is in labor, I can tell you exactly what would happen, the infant would be delivered. The infant would be kept comfortable. The infant would be resuscitated if that’s what the mother and the family desired, and then a discussion would ensue between the physicians and the mother,” he said. The entire purpose of this controversy was to take the Governor’s comments about abortion out of the news cycle. One commentator stated that he had the photo in October, but didn’t run with it because he couldn’t prove the source. If a conservative commentator had the pictures, it’s a pretty safe bet that the Democrats had them. Governor Northam committed the unpardonable sin in the Democrat party–he told the truth about abortion. I don’t think he will be asked to step down. The subject has been changed, and what has happened to him has warned other Democrats to avoid the subject. Mission accomplished for the Democrat party. Plymouth Rock Began As A Socialist Colony. The new Democrat party has moved left very quickly in the past two years. The term Democratic Socialist has been used to describe some of the young Democrats just getting their footing in the party. Actually, Socialist would probably be a better description. These young Democratic Socialists are a tribute to the damage done in recent years by our education system. They have not been taught the failures and atrocities associated with Socialism and believe that it is a fair system. They are not familiar with the Pilgrims early socialist experiment. Since the Pilgrims did not have enough funds to outfit for the journey and establish a colony, they sought help from the Virginia Company of London and the Virginia Company of Plymouth, companies known as “adventurers,” which were organized to fund and equip colonial enterprises. One of the key points of the contract between the Pilgrims and the Adventurers said that all colonists were to get their food, clothing, drink and provisions from the colony’s “common stock and goods.” In addition, during the first seven years, all profits earned by colonists would go into the “common stock” until they were divided. The Pilgrims actually wanted to own their own lands and homes and to work two days a week for their own gain, but the adventurers would not allow it. Once the agreement was signed, two ships were outfitted for the journey, the Speedwell and the Mayflower. But the Speedwell proved unseaworthy, so everyone still willing to make the journey—102 persons—crowded aboard the Mayflower and set sail. Patton wrote that after landing on Dec 21, 1620, the Pilgrims suffered horribly their first winter, with around half the colonists perishing. Aid from the now-famous native, Squanto, helped them survive with new planting techniques, but the harvests of 1621 and 1622 were still small. The colony’s governor, William Bradford, wrote that its socialist philosophy greatly hindered its growth: Young men resented working for the benefit of other men’s wives and children without compensation; healthy men who worked thought it unjust that they received no more food than weak men who could not; wives resented doing household chores for other men, considering it a kind of slavery. Governor Bradford wrote that to avoid famine in 1623, the Pilgrims abandoned socialism, Patton said. “At length, after much debate of things, the Governor (with the advice of the chiefest amongst them) gave way that they should set corn every man for his own particular, and in that regard trust to themselves; in all other things to go on in the general way as before. And so assigned to every family a parcel of land,” Bradford wrote. The colonists, each of whom now had to grow their own food, suddenly became very industrious, with women and children who earlier claimed weakness now going into the fields to plant corn. Three times the amount of corn was planted that year under the new system. Yes, America began as a socialist colony. When socialism did not result in prosperity, the Pilgrims switched to a free market economy and everyone prospered. We need to learn the lessons of history. The Georgia Democrat Party announced on SATURDAY that a handful of Georgia counties have suddenly discovered THOUSANDS of new votes that need to be counted. The Georgia Democrats say the new stash included absentee, early and election day votes. …Democrats in Georgia have now mysteriously discovered another 5,569 votes of which 4,804 were for Stacey Adams. One day after un-conceding the election, defeated Democrat candidate for Florida governor Tallahassee Mayor Andrew Gillum will hold a rally at a Broward County church Sunday evening sponsored by leftist political groups in support of the recount efforts that could upend the election day victory of Republican candidate Ron DeSantis. The rally is being called, “Count Every Vote: A Faith Response to the Florida Recount”. I also want every vote counted–every legal vote, but it seems odd to me that thousands of Democrat votes were discovered after the deadline for counting votes. There are also some questions about custody of ballots–people driving ballots around with only one person in the car–documenting the chain of custody seems to be a lost art in Florida. Hopefully this mess can be sorted out in the next few days. I believe that the Republicans won both in Florida and Georgia. If corruption can be proven in these states, those responsible for the corruption need to go to jail. We need to make sure that those who seek to cheat during elections are punished severely enough to discourage the practice. National Review reported yesterday that the Clintons are going on tour (together). The tour, which is being called “An Evening with the Clintons,” will be promoted by Live Nation, a prestigious live-events company that will help the couple fill massive arenas all over North America with thousands of attendees willing to pay as much as $288.44 to hear from the former president and secretary of state. It is interesting to me that the tour will begin on November 18–after the midterm elections. The article also notes that many of the candidates in the midterm elections did not want the endorsement of the Clintons–Hillary is considered a liability because she lost in 2016, and Bill is considered a liability because of the #metoo movement. I am simply not convinced that the Clintons were as much about building up the Democrat party as they are about building up their own personal influence and fortune. It will be interesting to see what the attendance is on this tour. I suspect it will be a total contrast to the number of people who come out to hear President Trump. Is The Democrat Party Heading Further Left? The Washington Post posted an article today about a primary election yesterday in Massachusetts. Boston city councilor Ayanna Pressley defeated veteran Rep. Michael E. Capuano (D-Mass.) in the primary to represent Massachusetts Seventh District in the U.S. House of Representatives. But the Capuano-Pressley race, which split Massachusetts Democrats and national liberals alike, had drawn the most attention. Capuano has been one of the House’s most reliably left-wing votes, especially on issues of war and defense funding. Pressley, a former Capitol Hill staffer long seen as a political star, had argued that she could lead “a movement” from the seat while Capuano was content to simply vote the right way. …But Pressley ran to Capuano’s left on a few key issues, calling for the abolition of Immigration and Customs Enforcement and for restoring voting rights to prisoners. She also gained an advantage over Capuano when the congressman groused that Democrats were becoming “balkanized” by racial identity. …Republicans never intended to contest the 7th District, which gave Hillary Clinton 84.1 percent of the vote in the 2016 presidential race and was previously represented by Democratic Party legends Tip O’Neill and John F. Kennedy. Massachusetts is basically a one-party state, and it is very liberal politically. I don’t know if the radical leftist views represented by Ayanna Pressley would win an election in many other areas of the country. At any rate, her election shows that the radical wing of the Democrat party is alive and well in certain areas of the country. As we have all come to know (and not appreciate), the campaign for the next presidential election starts the day after the last presidential election. Members of the party that did not win begin jockeying for position, assuring voters that they can beat the incumbent in the next election. It is a good time to watch the candidates and attempt to gauge the direction of the party. All indications within the Democrat party are that the party is moving significantly left, but trying not to be obvious about it. Local Congressional candidates are calling for abolishing ICE, instituting socialism, impeaching President Trump, free college tuition for everyone, etc. Nationally, party leaders are saying those are not priorities. (Well, I can guarantee that if the Democrats take the House of Representatives, one of their first issues will be impeachment, regardless of what they are saying.) Well, the Democrat presidential primary just got more interesting. The Democratic National Committee voted on Saturday to change the party’s supderdelegate rules for its presidential nominations. The DNC voted to weaken the role top party officials play in nominating their presidential nominee. A superdelegate is an unelected delegate that has the ability to support any candidate and aren’t beholden to results of a primary or caucus. Most superdelegates are current or former Democratic politicians. The fight over superdelegates was sparked over the 2016 Democratic primary where former Secretary of State Hillary Clinton was favored heavily by superdelegates over self-proclaimed democratic socialist Sen. Bernie Sanders (I., Vt.). Clinton was able to secure the nomination sooner with the help of superdelegates and thus end Sander’s campaign. Sanders and many of his supporters have criticized the use of superdelegates and characterized them as a mechanism that subverted the will of the people. CNN reports the vote was almost unanimous. The superdelegates were instituted after the 1972 and 1980 elections, where more Democrats participated in the primary elections, but the candidates were defeated by landslides at the polls. Evidently Democrat primary voters did not represent a majority of the country, so the Democrats rigged the system so that candidates could again be chosen in the traditional smoke-filled rooms. That has seemed to work better for them. Even when they haven’t won, they have at least been in the running. Superdelegates will no longer be able to vote on the first ballot at the convention unless the candidate has received the necessary pledged delegates, which are based off primary and caucus results, to secure the nomination. The fight over superdelegates has divided Democrats but it appears Saturday’s rule change was a compromise most were willing to accept. This primary season will definitely be a get-out-the-popcorn moment as the establishment Democrats fight to keep control of their party. Yesterday The Los Angeles Times reported that California Democrat leaders have endorsed Kevin de León for Senate in a stinging rebuke of Democratic Senator Dianne Feinstein. Senator Feinstein has been in the Senate since 1992. While some voters might see her an a poster child for term limits, she has been a mostly rational voice on the liberal side of the aisle during her time in the Senate. However, she has been rejected in favor of someone who has espoused views very much to the left of her views. De León’s campaign has focused on the party’s energized liberal faction. He supports single-payer healthcare, aggressive goals for renewable energy and helped lead the successful effort to raise the state’s minimum wage to $15 an hour. He has criticized Feinstein, known for having moderate tendencies, for being too conciliatory toward Trump, such as when she urged people to have “patience” with the president last year. This is bullying. In most circles it is unacceptable; however, I guess it is acceptable in today’s Democrat party. That is truly sad. When confronted with what she said, Representative Waters blamed President Trump for the lack of civil discourse. I would like to point out that it was not President Trump that made these statements–it was Representative Waters. Who Benefited From The Tax Cuts? On Friday, Investor’s Business Daily posted an article about the Trump Tax Cuts. The numbers are now in. According to Congress’ nonpartisan Joint Committee on Taxation (JCT), the rich are now paying a higher share of federal taxes after enactment of the Republican tax reform plan than before. For 2017, before tax reform, the JCT estimates those earning $1 million or more a year paid 19.5% of all federal taxes, counting income taxes, payroll taxes, and excise taxes. But for 2018, after tax reform, the committee estimates that these same millionaire taxpayers will pay 20.4% of all federal taxes. The biggest relative tax cuts resulting from the tax reform are for those making less than $50,000 a year. Their share of federal taxes fell from 4.4% to 3.8%, a tax cut of 14%. Indeed, the committee estimates that the federal tax burden went up for all taxpayers now making over $200,000 a year, from 49.8% before tax reform, to 51.3% this year after tax reform. 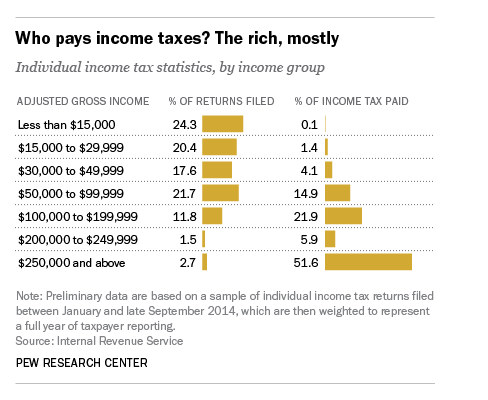 You have to go down to those making between $100,000 and $200,000 a year to find taxpayers paying a lower share of federal taxes, from 29% of the federal tax burden last year to 28.8% this year. But how could that be? The fundamental reason is the economic growth effects of tax reform. Higher economic growth means increased wages, jobs, employment and income. As the economy grows, the share of taxes paid, especially by those earning higher incomes who still pay much higher tax rates under our so-called “progressive” tax code, goes up as well. This is the Democrats’ biggest nightmare. That is the reason they opposed the tax cuts and tried to use the media to turn the American people against the idea of tax cuts. I believe that in the 2018 mid-term elections, we will see the Democrats attempt to campaign on the idea that the tax cuts were ‘tax cuts for the rich,’ but if American voters choose to be informed, they will recognize the lie in that statement. Those same economic effects of the tax reform amount to economic liberation for the poor, working people and the middle class. After 8 years of economic stagnation under the neo-socialist policies of Obamanomics, the rising wages, jobs, employment and income under the long overdue Trump Republican economic recovery are making America great again for those with low and moderate incomes. Top economists estimate wages for average middle-class families are increasing by $4,000 a year due to tax reform. That’s in addition to direct tax cuts of $2,000 a year for middle class families. These economic effects are why we now see the lowest unemployment rates among blacks in American history. And despite the lies of the Democrat fake news media, the lowest unemployment rates among Hispanics in history as well. And these economic effects are why Trump/Republican economics is now resonating among blacks and Hispanics culturally as well, from young black Millennials like Candace Owens to hip-hop stars like Kanye West. As John F. Kennedy stated, “A rising tide lifts all the boats. '” We have watched the tax cuts (and the ending of some over regulation) do just that. John Kennedy would probably not be welcome in today’s Democrat party. That is a shame. In spite of his questionable activities regarding women, I believe he would have been a reasonable President had he lived. How Many Democrats Have Been Mugged By Reality? I used to be a Democrat. I voted for George McGovern for President. I stayed a Democrat until about half way through Jimmy Carter‘s presidency. At that point I was mugged by reality. Evidently I was not the only one. People don’t remember that in the 1970s, there was a strong conservative wing of the Democratic Party. Pat Moynahan, Hubert Humphrey, Scoop Jackson, they were called the Coalition for a Democratic Majority, Committee for the Present Danger… that is where I came out of. Joe Lieberman is the last of those Mohicans, and obviously he had no home in the end. KURTZ: You were trained, as you mentioned, as a doctor. Does that influence your political prognostications? Analyzing the sanity of those in the political community, perhaps? KRAUTHAMMER: Oh, no, it never does. However, my training as an M.D. has made me particularly open to empirical evidence. And when you talked about my evolution from a liberal to a conservative, it isn’t that i had an epiphany, the clouds parting and a shaft of light from the sky. I was open to empirical evidence, on the War on Poverty, the Great Society, which I believed in and saw it didn’t work, at least the evidence I read, and I changed. That is the major influence on my life. I suspect that I am not the only person who can relate to that statement. Ed Morrissey posted an article at Hot Air today about President Obama’s impact on the Democrat party. Mr. Morrissey states that members of the party are seeing the damage President Obama has done to the party and are asking him to move to the center to make peace with the Republicans. It is becoming very clear that President Obama has no such intentions. As much Hillary Clinton anticipation as there is, two weeks later, Democrats are still reeling and anxious. Obama may have built his political career without the party — and created anti-establishment alternatives — but he’s a lame duck with a new Congress that’s been elected to oppose him. He needs Democrats. And they need him. President Obama could easily make Washington work–under normal conditions, a President who was so soundly defeated in the mid-term election would move toward the center. We are already seeing that President Obama has no such intention. Obama didn’t learn the Bill Clinton lesson after the first midterms. He’s not interested in learning it after his second massive defeat, either. Even with Bill Clinton’s more strategic direction, Democrats ended up losing narrowly at the end of his presidency. 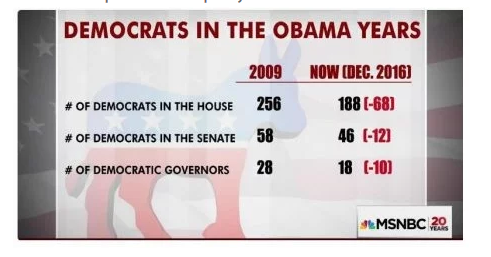 Obama may be leading Democrats into a reverse 2008, or perhaps even worse. The future looks very interesting. The Washington Times reported yesterday that after Tuesday’s election, Nancy Pelosi and Harry Reid have both expressed a desire to stay on as the Democrat party leaders in Congress. House Minority Leader Nancy Pelosi asked her fellow Democrats to keep her on as their leader in the new Congress next year, saying she still has unfinished goals she wants to accomplish. She said the chief message she took from Tuesday’s election, which saw Democrats eviscerated at all levels, is that voter suppression was a problem. I would be more than willing to guarantee that voter fraud on the part of Democrats was more of a problem than voter suppression. The Californian is likely to get her colleagues’ support to remain as their leader, and Senate Democrats’ leader, Sen. Harry Reid, has indicated he will stay on as they shift to the minority, meaning that despite devastating losses in both chambers, Democrats will keep their leadership team intact. Admittedly, President Obama is the major part of the reason the Democrats took a beating on Tuesday, but Representative Pelosi and Senator Reid were also part of the problem. When a football team continually loses games, you change the coaching team. If the Democrats want to regain control of the House and the Senate, they need to retool their leadership team–it is not an attractive team. In recent weeks, I have heard many Democrat party pundits (some disguised as news reporters) explain why the Democrats should not worry about the 2014 mid-term elections. Obviously these pundits have been proven wrong, but it might be a good idea to take a look at the reasons behind the statement. 1) The election wouldn’t be a referendum on President Obama. 3) An improving economy would limit Democrats’ losses. 4) Women would save Democrats. 5) The ground game would power Democrats to victory. So let’s take a look at these ideas. Most of the Republican candidates for Congress used campaign ads that tied the Democrat candidate to President Obama–often citing how often the Democrat candidate voted for President Obama’s policies. You could argue that it wasn’t a referendum on President Obama, but it was a referendum on his policies. ObamaCare was not passed in a regular legislative process–the Democrats had to play parliamentary games to get it through–without one Republican vote. I believe the voters resented that, and that they will resent it even more when they see their new premium hikes. Many voters also resented the fact that they were not able to keep either their health insurance or their doctors (as they were promised). Although President Obama claims that the economy is recovering due to his policies, Americans are not convinced. Under the Obama Administration, voters have seen the workforce shrink, the gap between rich and poor increase, and the income and wealth of middle class families decrease. The stock market may be roaring, but the average American is not seeing prosperity. Women did not bring the Democrat Congressional candidates across the finish line. There are many women who do not feel that the government has to be their caretaker. Some of us resent the fact that the government is requiring private corporations to provide forms of birth control that include abortion. Not every woman wants the government to be her sugar daddy–some of us think we can make it on our own. About that Democrat ground game. The ground game doesn’t work if you are selling a product no one wants. The special interest groups that voted for President Obama in 2012 have not been able to collect on what they were promised. The youth vote can’t find jobs and the unemployment rate in the black community is still very high. The naive youth vote has now lost its naivety. They are not likely to be fooled by empty promises again. Also, contrary to what the media has tried to tell us–Republicans are not stupid–they are as capable of getting out the vote as the Democrats–they just need to make sure they have a salable product. This is a beginning. A beginning is nice, but more important is where we go from here. The national debt is spiraling out of control, the government takeover of healthcare is a disaster, and over regulation is stopping economic growth. It’s time to deal with these issues. We still don’t know exactly what went on with the Internal Revenue Service (IRS) and the targeting of conservatives and conservative groups. I can tell you that after making a small donation to the Tea Party a few years ago, my husband and I were audited for the first time in 45 years (nothing in our taxes had changed). Well, evidently the targeting of conservatives was aided and abetted by some members of Congress. Yesterday The Daily Caller reported that they had obtained copies of correspondence between Senator Jeanne Shaheen and the IRS showing a plan to harass conservative groups during the 2012 election. “The IRS is aware of the current public interest in this issue,” IRS chief counsel William J. Wilkins, a White House visitor described by insiders as “The President’s Man at the IRS,” personally wrote in a hand-stamped memo to “Senator Shaheen” on official Department of the Treasury letterhead on April 25, 2012. The memo, obtained by TheDC, briefed the Democratic senator about a coordinated IRS-Treasury Department plot to target political activity by nonprofit 501(c)(4) groups. The plot was operating out of Lois Lerner’s Tax Exempt Government Entities Division. …Shaheen got the inside info from the IRS, making it clear she was the point person in a group composed of six close Democratic colleagues including Chuck Schumer and Al Franken, who joined with Shaheen in quietly writing a letter to then-IRS commissioner Doug Shulman expressing their concern about new nonprofit groups engaging in political activity in 2012. The Democratic senators’ publicly available March 9, 2012 letter asked the IRS to “immediately change the administrative framework for enforcement of the tax code as it applies to groups designated as ‘social welfare’ organizations” by introducing a new “bright line test” for how much a tax-exempt group can invest in political activity and by setting a new rule that at least 51 percent of a group’s activity must non-political. The senators called for more elaborate disclosures about finances and “undertakings” in groups’ form 990 submissions and sought new rules about how much donors could write off as business expenses. The problem here is that the new rules would be specifically aimed at conservative groups. There was no effort made to be even-handed about putting restrictions on liberal PAC’s, unions, or other groups on the left side of the aisle. Unfortunately many Democrats do not endorse the concept of free speech when it does not conform to their ideas. The Democrat party has also shown that it is not above using the full weight of the government to stifle conservative speech. Using the government as a political weapon is not an idea that belongs in a representative republic. On April 30th, Marc Thiessen posted an article in the Washington Post about some statements in former CIA counterterrorism chief Jose Rodriguez’s new book. Mr. Rodriguez is doing the talk show circuit to publicize his book about his days at the CIA. In the book Mr. Rodriguez recounts events showing that then Speaker of the House Nancy Pelosi lied when she stated that she was not aware that waterboarding was used on captured terrorists. Why is this important? A few years ago David Limbaugh wrote a book called, BANKRUPT, The Intellectual and Moral Bankruptcy of Today’s Democratic Party. The book details the recent history of the Democrat Party playing politics with important matters of national security. I strongly recommend it, although it did make me very angry. Because the reports of the briefing of Speaker Pelosi including the information in question remain classified, there is no way of confirming either Ms. Pelosi’s or Mr. Rodriguez’s story. It would help all Americans if those documents were de-classified. The Nashville Business Journal reported on Wednesday that federal authorities filed a complaint in U.S. District Court for the Middle District of Tennessee that mirrors a 2010 action that sought official forfeiture of wood obtained in a 2009 raid of Gibson facilities. The latter of those cases has been stayed, pending the outcome of the most recent suit. As has been the case in previous allegations, at issue is the classification of certain wood imported to the United States from India. Namely, a June shipment of 1,250 sawn logs was classified as “finished parts of musical instruments,” which is allowed under Indian law. In reality, according to the sworn affidavit of Fish and Wildlife Service agent Kevin Seiler, the wood was unfinished – a violation of the Lacey Act. There are a few interesting facts about this action. First of all, the laws of India were totally complied with–the Obama administration is the problem. Second of all, the question is not the wood–the question is whether or not the wood is unfinished. Think about that a minute. If people in India do the job, it is okay with the government. If people in America do the job, the Obama administration raids their company. I thought the Obama administration was trying to keep jobs in America. I am sure that it is simply an incredible coincidence that one of Gibson Guitar’s main competitors is a major contributor to Democrat Party coffers.